The powerhouse within the MATCH series for individual system concepts – not less than eight amplifier channels and even nine separate DSP channels make this extremely powerful Plug & Play amplifier to a sound virtuoso for the expansion of OEM sound systems. The "heart" of the PP 86DSP is a 64 Bit DSP of the latest generation with enormous processing power and ultimate sound optimization opportunities. The package is complemented by Audiotec Fischers proprietary Class HD technology which combines maximum efficiency with minimum space requirements. Besides a 6-channel highlevel input with ADEP circuit (Advanced Diagnostics Error Protection), the PP 86DSP is as well equipped with a MATCH Extension Card slot. This allows adding further interfaces like a Bluetooth® Audio Streaming module or a High Resolution Audio USB soundcard. Thanks to the professional and user-friendly DSP PC-Tool V4 software with its bunch of new functions an individual sound setup becomes straightforward and intuitive. No doubt - a sound upgrade with this amplifier will be a lot of fun. 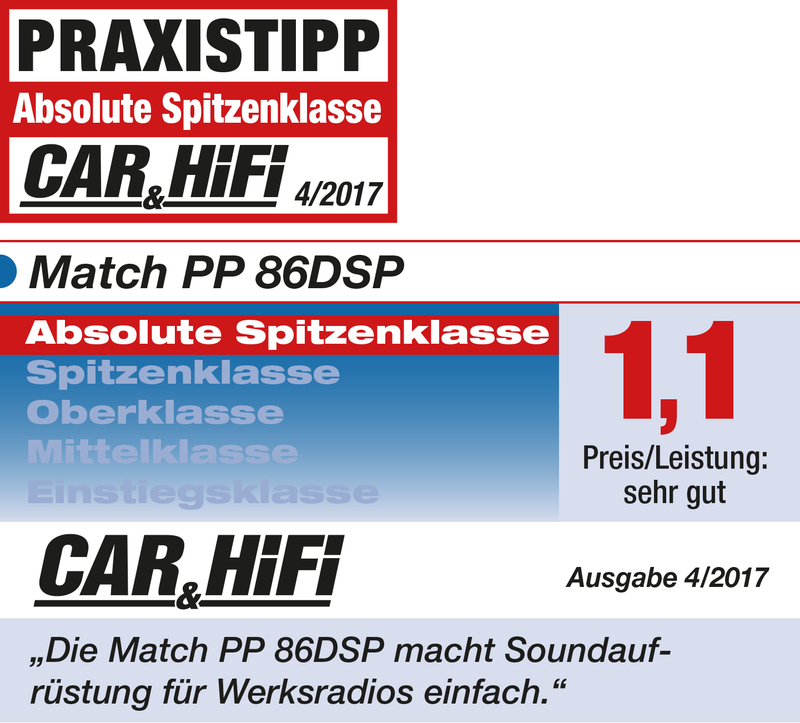 The PP 86DSP combines the advantages of a Class H technology with the principle of a class D amplifier. The result is an unsurpassed efficiency which easily outperforms any conventional Class D amplifier. By varying the internal supply voltage depending on the amplifier’s amplitude of the input signals, idle losses are significantly reduced and overall efficiency is close to maximum at any time. switching between analog and digital inputs. Note: For car radios without ISO connectors an additional ISO-adaptor (PP-AC cable harness) is needed, which has to be connected between the ISO cable harness (PP-ISO) and the car radio.